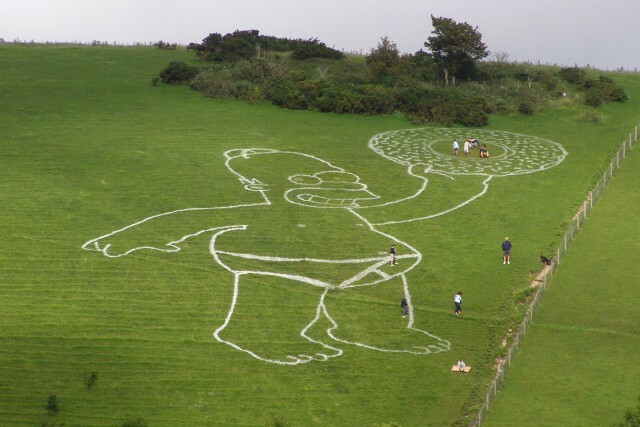 The great Homer Simpson once said "People can come up with statistics to prove anything." But an accurate statistical analysis can show significant results. So whether you're making important quality improvement decisions or simply studying a subject that you're interested in, make sure you collect data that that eats the entire doughnut. Erm, I mean, paints the entire picture. I’ve used ANOVA and distributions of winning percentages to show that MLB has the most parity and the NFL has the least. But the goal of every professional team isn't to win the regular season, it's to win the postseason. 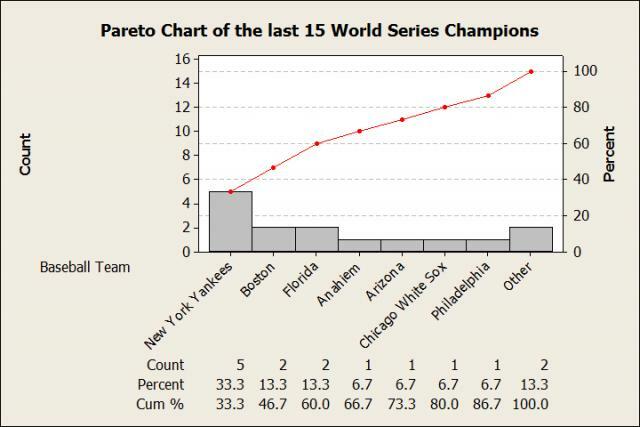 So to complete my data analysis of parity, I'll use Minitab's Pareto Chart to see how the championships of each league have been distributed over the last 15 years. Note: This data was collected before the conclusion of the 2011 NBA and NHL finals. 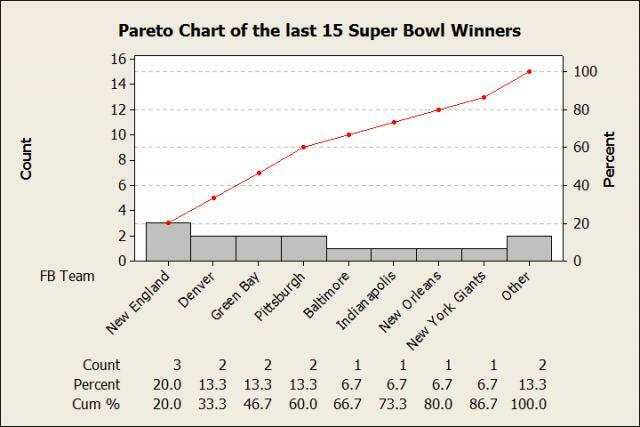 So what do the Pareto charts show us? Only 3 teams account for 80% of NBA Championships over the last 15 years. That's parity! The NHL and MLB need 6 teams to account for 80%, while the NFL needs 7 teams! Also, hockey and baseball are almost identical! People always complain that there is no parity in baseball because the Yankees and Red Sox win every year. But those two teams account for the exact same percentage of championships over the last 15 years as the Red Wings and Devils. 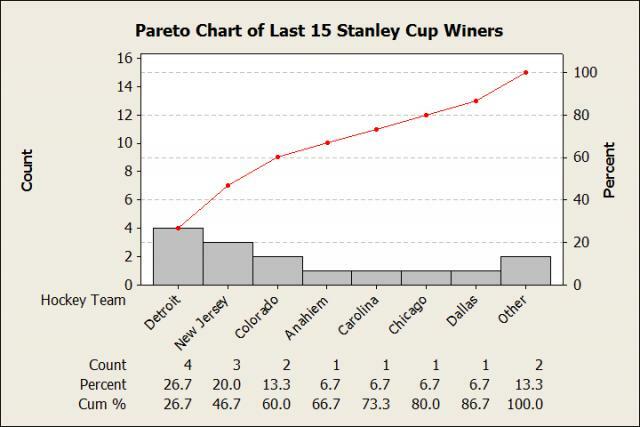 You never hear anybody complaining in hockey because Detroit and New Jersey win everything. But what is up with the NFL? I already showed that football has the least amount of parity. 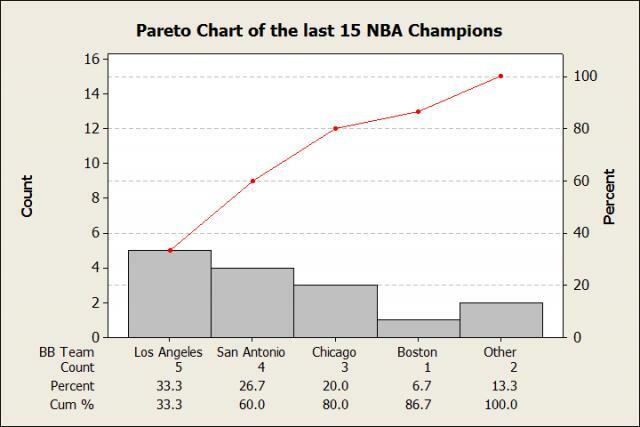 But the Pareto chart shows it has the most parity when it comes to winning championships. Is Homer Simpson right? Did I just come up with statistics that prove the NFL has the most and least amount of parity? It definitely looks like I did, but there is one thing we should keep in mind: How does each sport conduct their post season? In football, you only need to win one game to advance to the next round. In the other three sports, you have to win a series of seven (or five) games. And it’s a lot easier to upset a team that is better than yours 1 time rather than having to do it 4 times. For example, Team A and Team B meet in the playoffs. For simplicity's sake, let's say Team A has a 40% chance of winning a single game. If they play just one game, Team A has a 40% chance of advancing to the next round. But if they have to win a seven-game series, their probability drops to 29%. So even though these are the exact same teams, it's going to look like there is more parity in the league with the one-game playoff series because the worse teams have a better chance of advancing. I sure wouldn't want to have beat Peyton Manning 4 times, or perform well against the Steelers defense 4 times. And could the 2007 New York Giants really have defeated the Patriots in a best-of-seven series? In fact, you know how the Bulls won 6 championships in a row with Michael Jordan on the team? Well if the NBA had the winner of the first game advance, Chicago would have won only two championships in that same span. Just two! And they are considered to be one of the greatest dynasties of all time! So the numbers have shown that the NFL and NBA are the leagues with the least amount of parity. The reason the NFL seems to have parity is because of their wide variety of champions. But this has more to do with how their post season is structured and less with them actually having parity. When we accurately assess all the numbers, we see that the sport with the most parity really is Major League Baseball, with the National Hockey League coming in a close second.